“A number of years ago, I was diagnosed with spinal stenosis. The pain got so severe that my primary doctor suggested that I see a spine specialist and see where he liked to go from there or what he would suggest for me. So naturally it was an operation. I was desperate, agreed to it. And after the operation, he said, well, it didn’t come out that great and I’m not going to even send you to rehab because you really have a bad case of stenosis. So I said, well, what about the pain? What should I do about the pain? And he said, well, take two Tylenol and if you’re allergic to that, take two Advil. And as I walked out with my husband from his office, I thought, what do I do now? Where do I go? It wasn’t getting any better. So I thought, you know what, maybe acupuncture. Let me try acupuncture. So I did. And, and that was okay for about a week or two and there was the pain again. So then I thought if he said I shouldn’t go to Rehab, you know what? I’m going to try it. They offer all sorts of things. So in Rehab they welcomed me. And in Rehab I had, let’s see, deep tissue massage, Yoga for the spine, let’s see, what else was there? Chiropractic. And after a while they said, you know you’re complaining that you come every week and you’re still in pain. We can’t do anything for you. So we suggest that you try pain management? I never heard of pain management, didn’t know what pain management and was. Well, thank God. 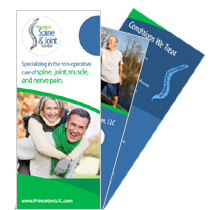 One of the ladies there at the Rehab mentioned the Princeton Spine and Joint Center. And I said, what do I have to lose? It’s not going to work, but I’ll go. So I went and met this wonderful doctor, Zinovy Meyler. And he welcomed me and listened to me and started treatments immediately. At first, the first week I called up, I said ‘nothing’. He said, well, give it a few more days. Be patient with it. Let your body adjust to this. And you know what? He was right. And treatment after treatment, I began to say to my husband, he said, look, you’re walking straighter. You’re not complaining about your back. He saw a whole change in me. My personality changed, and I just couldn’t wait to go back again.